I recently got a hard drive working that was previously believed to be dead. I managed to transfer many file folders containing pictures that I could before it conked out on me again. Those folders contained pictures that I was to use for future blog posts. 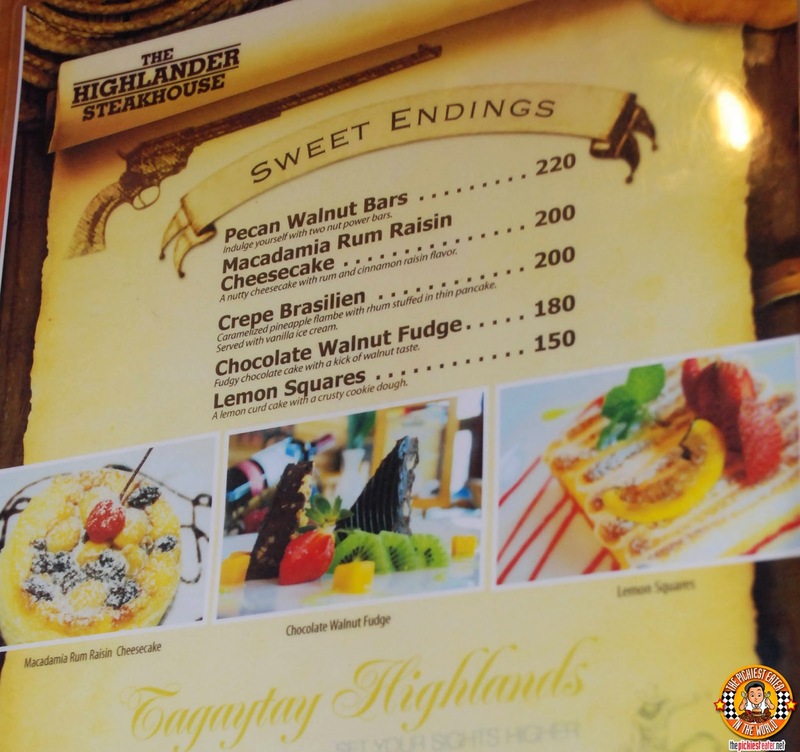 One of those posts was our family trip to Tagaytay Highlands, and the famous Highlander Steakhouse. 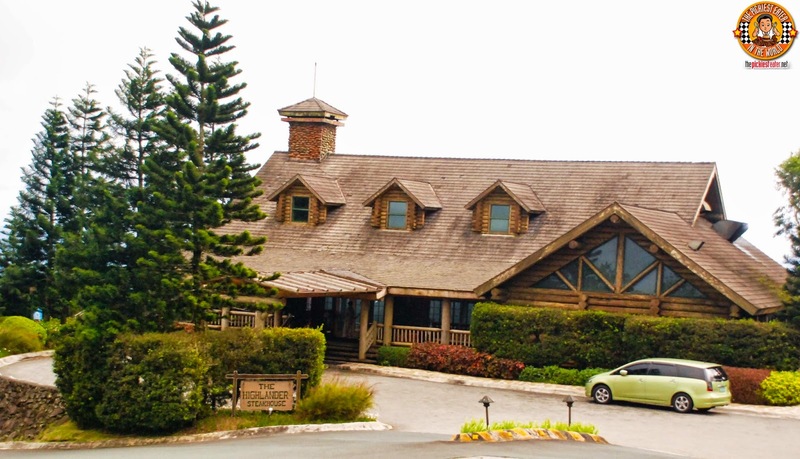 The famed Highlander Steakhouse is located within the posh Tagaytay Highlands in Tagaytay. 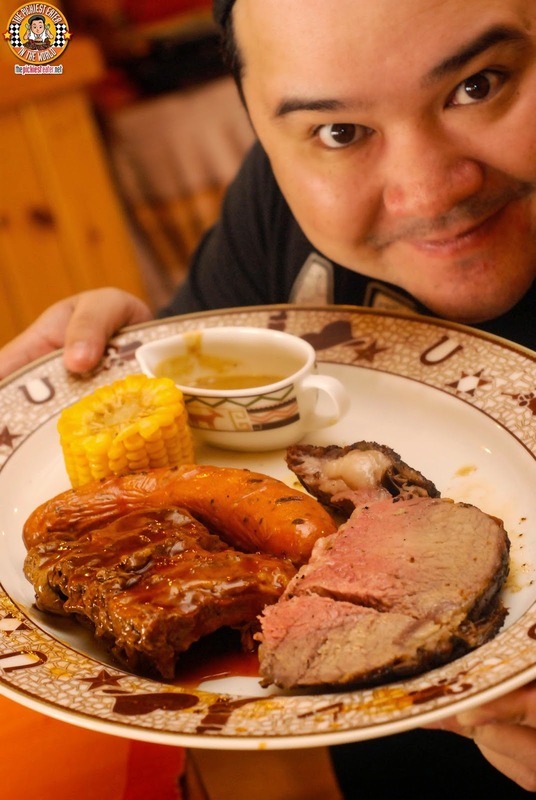 Rina's Aunt has a condominium within Highlands so we were granted access to the exclusive Steakhouse. Unfortunately, since it was the holiday season, it was virtually impossible to make reservations, so we decided to try our luck as walk ins when the doors of the restaurant opened. The strategy proved to work, because we got there at 10:45am, just a little bit before the start of business hours at 11:00am, and for the first few minutes, we had the entire restaurant to ourselves. I gotta say, the place is absolutely gorgeous. 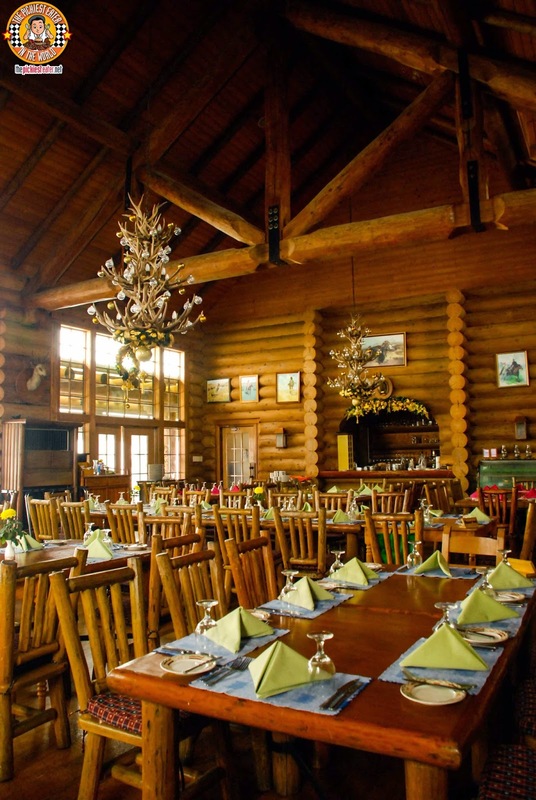 I always tell Rina that I would love to have a log cabin somewhere in Colorado or Montana as a vacation home, so on the onset I was stoked with the wooden interiors. 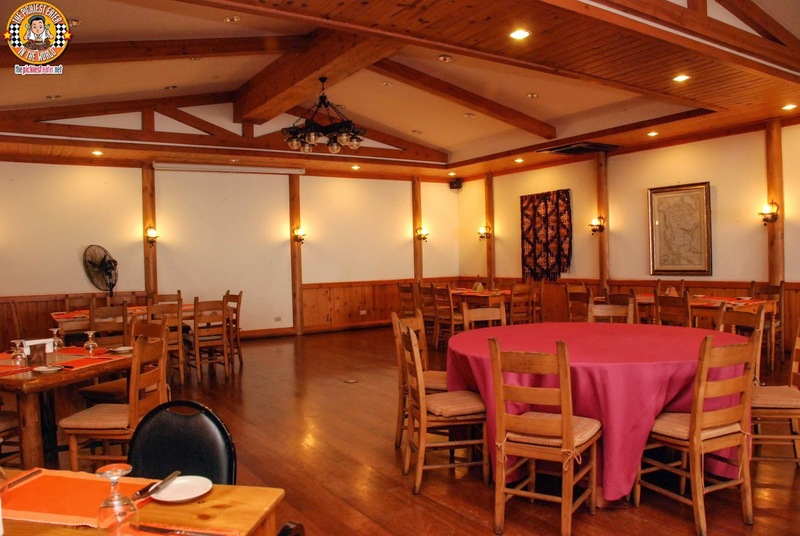 The room was filled with the refreshing smell of pine, which I found uncanny considering the amount of sizzling meat that goes through the banquet halls on a daily basis. 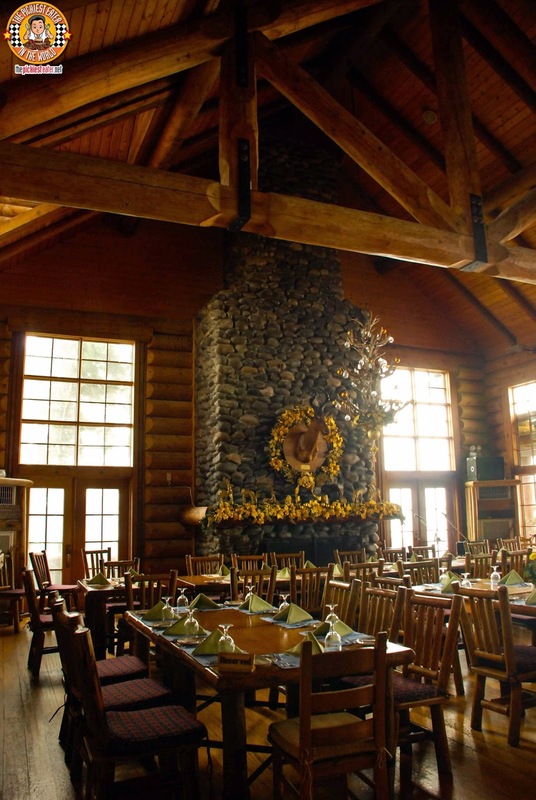 Walk ins were seated in the lower floor, which still had the country home interiors. Nothing like warm a warm Baguette and Sourdough bread on a wooden board to make you feel like a cowboy. 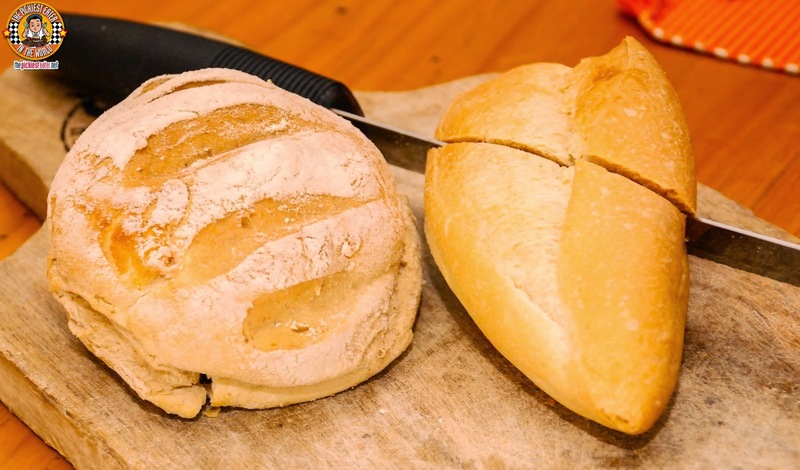 The bread was nicely toasted and the butter virtually melted once spread over the insides. Since it was a chilly morning up in the mountains, it made sense that Rina ordered the Cream of Mushroom soup in Puff Pastry (P180). At first glance I initially thought it was a Chicken Pot Pie. 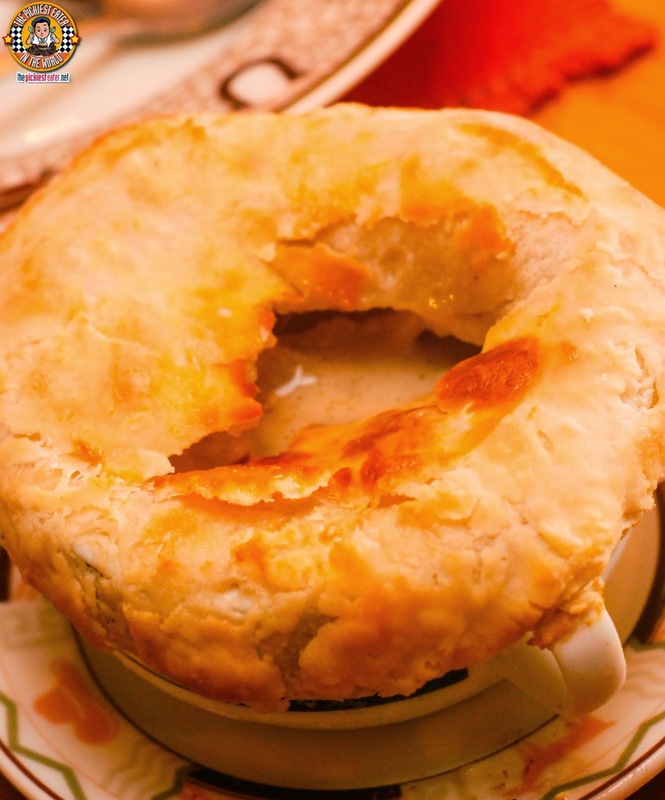 Piercing through the flakey pastry reveals a rich, creamy soup lurking beneath. 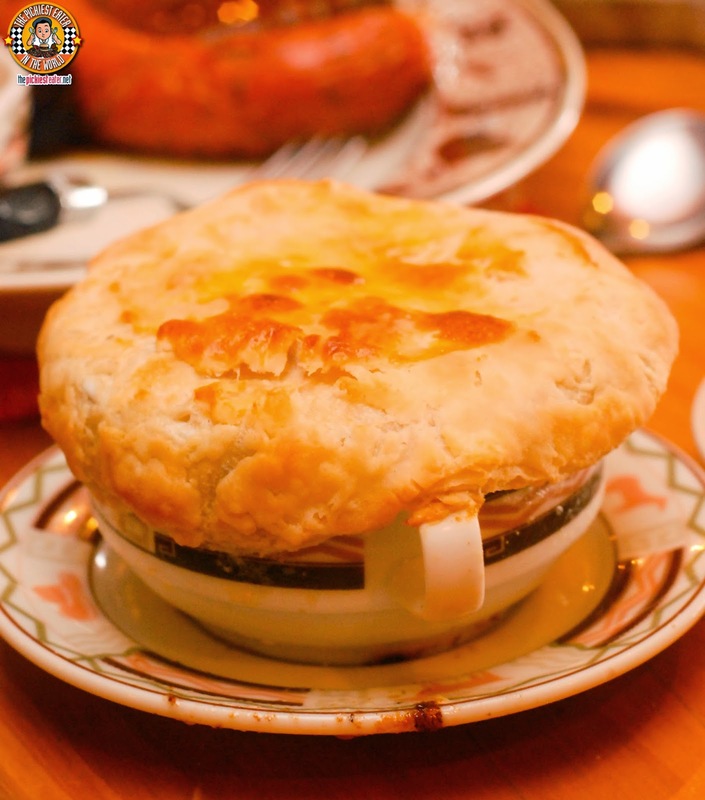 When you consider the heaviness of the creamy soup, and the soaking of the flakey pastry into its mushroom bath, the dish is deceitfully filling. 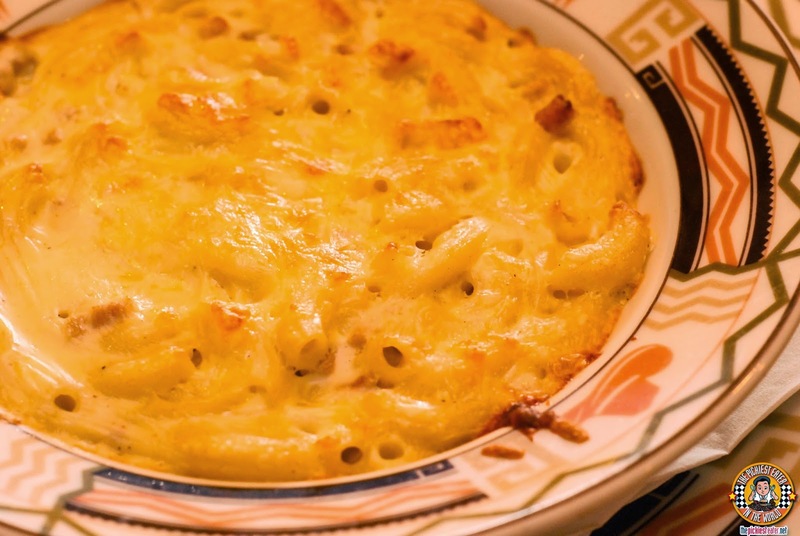 Rina ordered the Macaroni and Cheese (P220) off the Kids's Menu for Rain. Truthfully it wasn't anything spectacular. Better than boxed for sure, but nothing really that'll knock your socks off. But then again, as a kids meal, it fulfilled its purpose. Rina and her sister Pink Turbo are addicted to shrimps in any shape or form. When they saw the Popcorn Shrimp (P280) in the Kids Meal menu, they decided to try it as well. I'm giving this dish a bit of leeway because this was meant to be for a child, because those six tiny pieces of breaded shrimp might have caused two adult sisters to never speak to each other again. 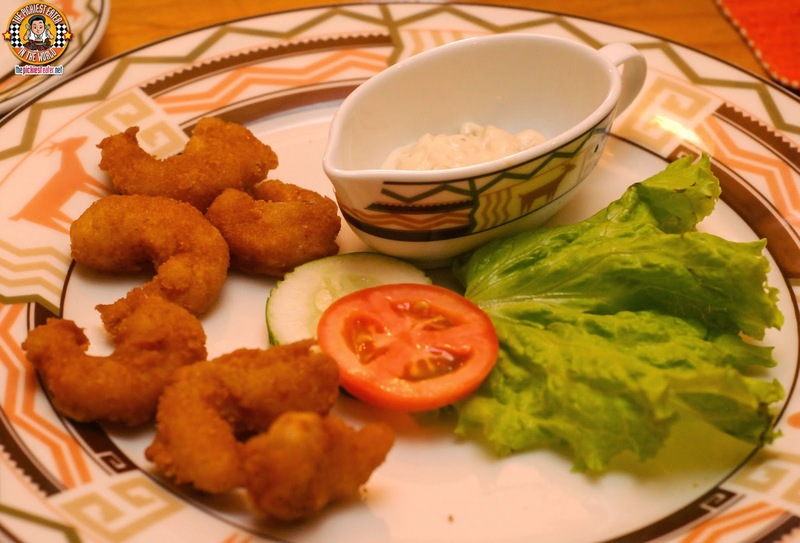 Rina admitted that the shrimps were actually pretty good, and would be more than enough to satisfy a toddler. 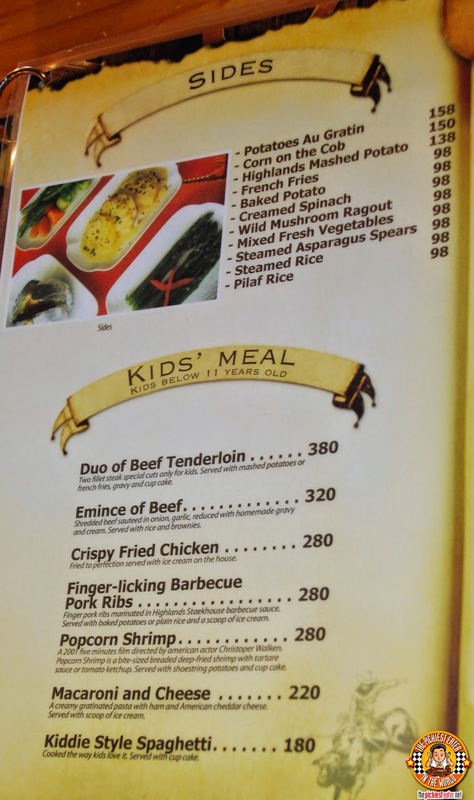 My only note is that a slice of tomato, cucumber and a lettuce leaf isn't exactly a fitting side dish or garnish for a child. I think something like Corn or mashed potatoes would have worked better. 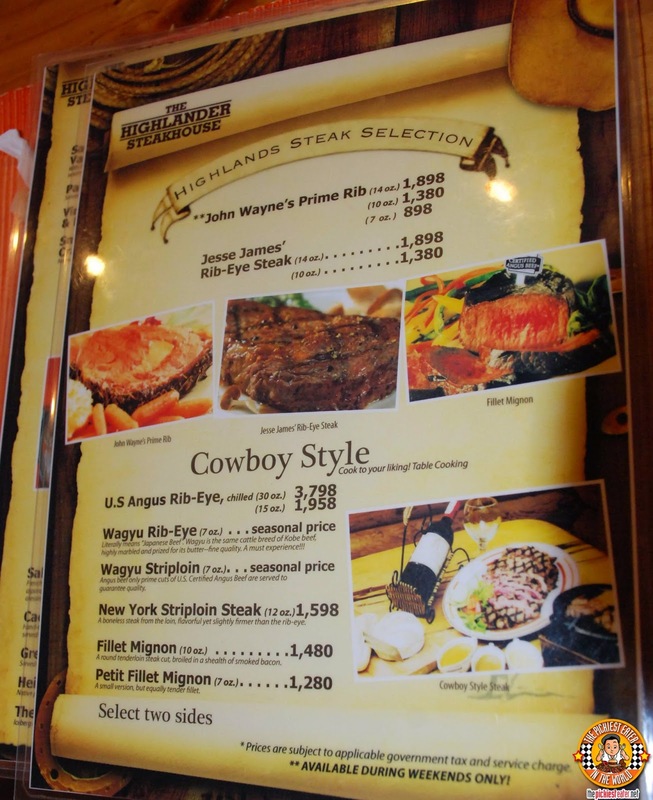 All the adults aside from me had the John Wayne's Prime Rib 10 oz (P1,380) from Highlander Steakhouse's "Steak Selection". Undoubtedly, an amazing piece of meat, that was seared just right with light char marks across it. I think it's a pretty reasonable deal for the price, although I wish it had a bit more fat to it. 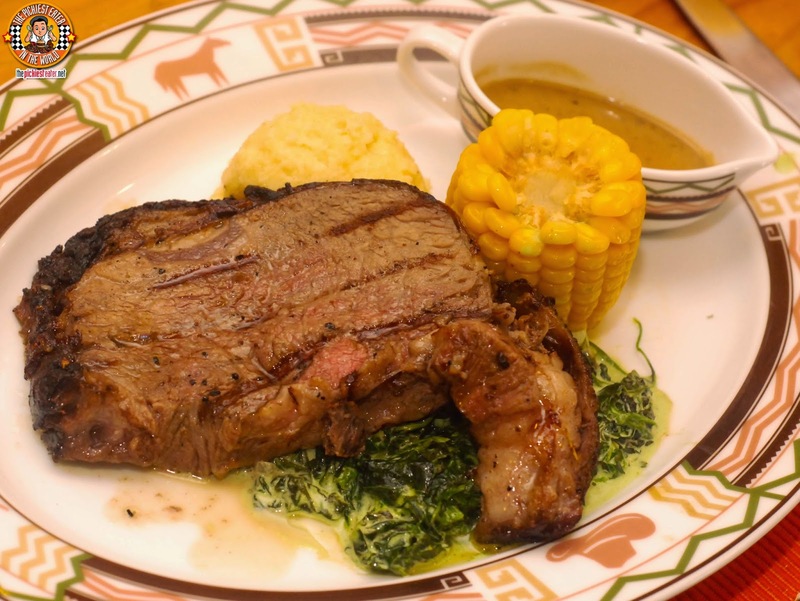 The steak came with two sides, so Rina had some Creamed Spinach, Corn on the Cob and an extra side of Mashed Potatoes, all of which she enjoyed. 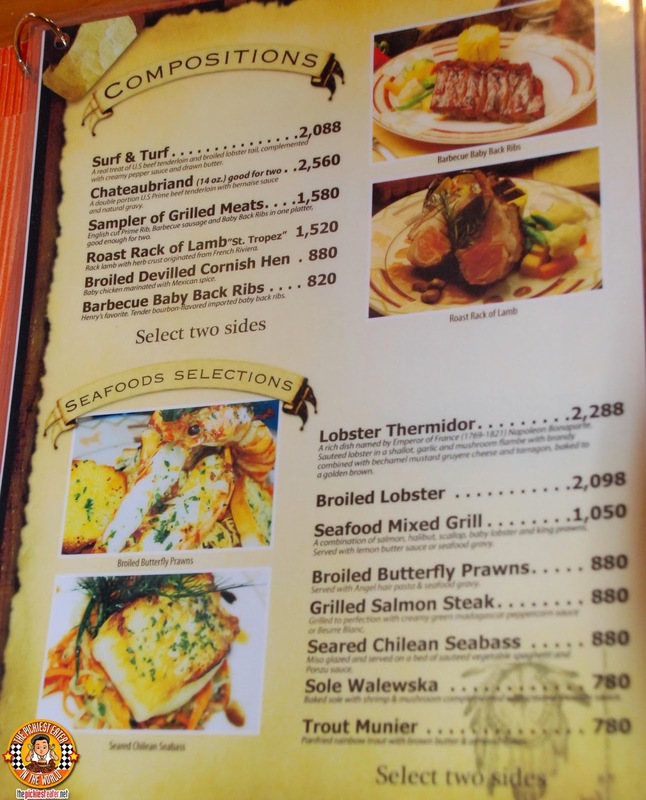 Since I didn't know when I would ever get the chance to dine at Highlander Steakhouse again, I decided to get the dish wherein I could the best bang for the buck. 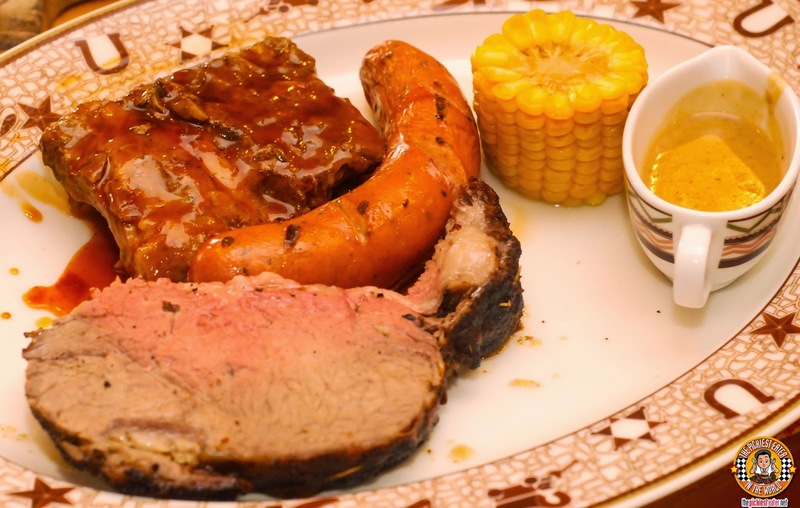 So I ordered the Sampler of Grilled Meats (P1,580), which was a menagerie of some of Highlander's finest meat dishes. 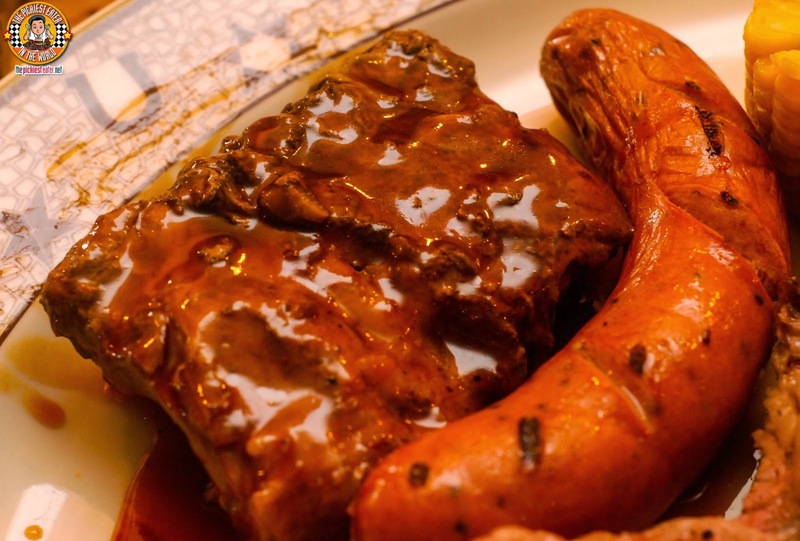 The sampler had three components, starting with the delicious, Fall-off-the-bone Baby Back Ribs, which was bathed in a sweet and tangy BBQ sauce. The second piece of the platter was the Barbecued Sausage, which had a great meatiness to go with a juicy snap with every bite. It was good enough for Rina to offer me a little bit of her steak fat in exchange for a small piece of sausage. 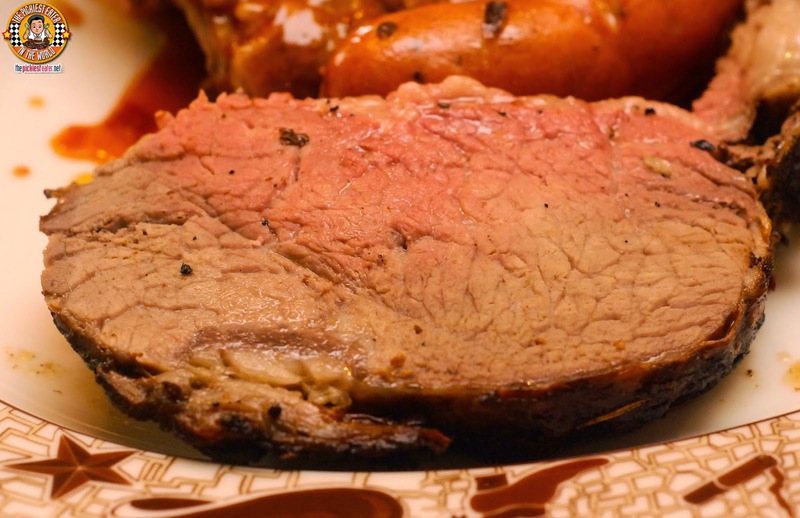 The central piece of the Sampler is the the English Cut Prime Rib. This was quite similar to the John Wayne cut, however it was cut in half. And unfortunately, the half that was served to me was the part that was seriously lacking in fat. The quality of the beef was exceptional, however like I've mentioned time and time again, I always look for fat. On the whole though, this is still a great deal, especially when you consider that this sampler platter is actually meant for two people. 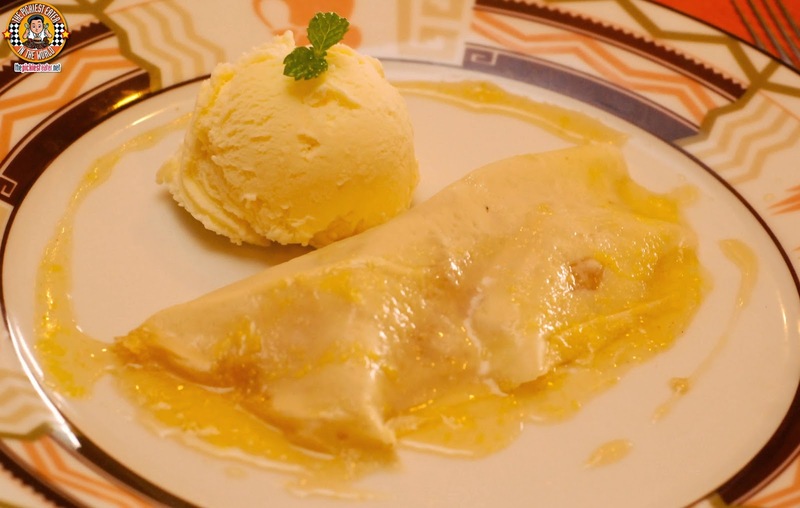 For Dessert, we decided to split the Crepe Brasilien (P200). This was a caramelized pineapple flambe with a dash of rum, delicately wrapped within a thin crepe. Quite good, but notches below crepe specialists such as Cafe Breton and La Creperie. 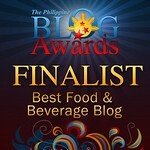 If you're in Tagaytay, this would definitely a great place to dine at. But truthfully, if you're still in Manila and looking for an amazing steak meal, I'm pretty sure you can find a restaurant at par within the metro, making the long drive totally unnecessary. 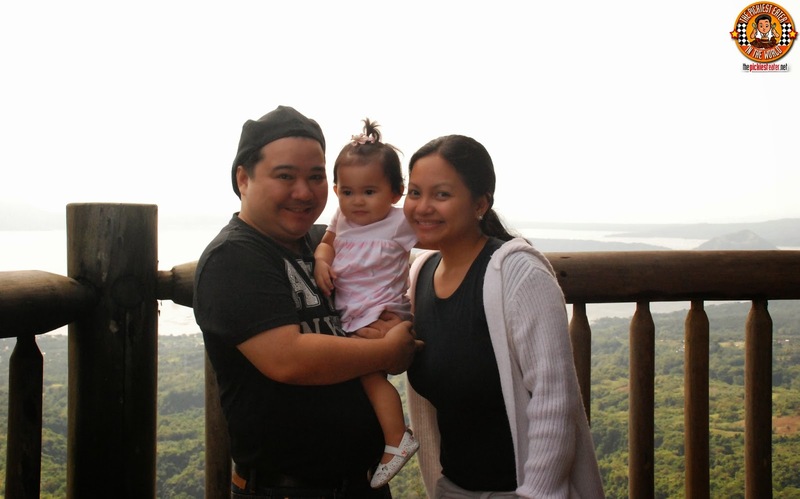 However, the scenic ambiance that comes with the beautiful utopia that is Tagaytay is unparalleled. 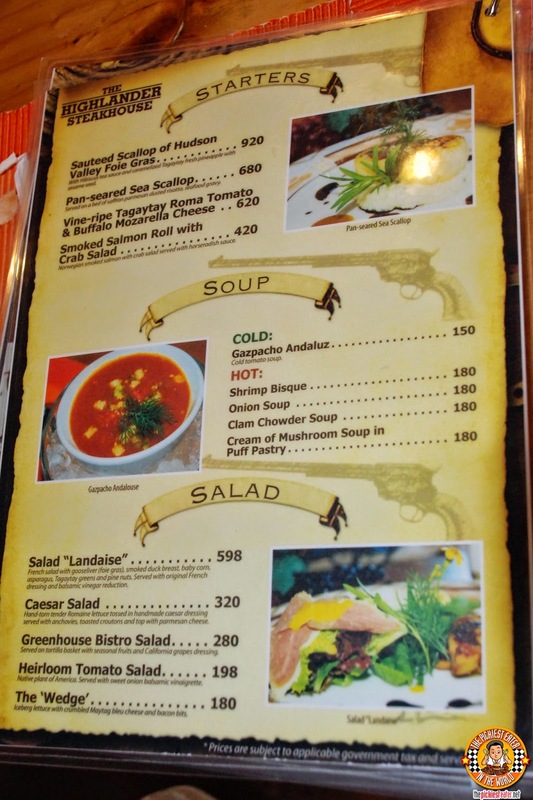 Steaaaakkkk lol :) Do they still have their unli steak promo?